Today Rome burned. You have seen the videos, the photos, the comments. 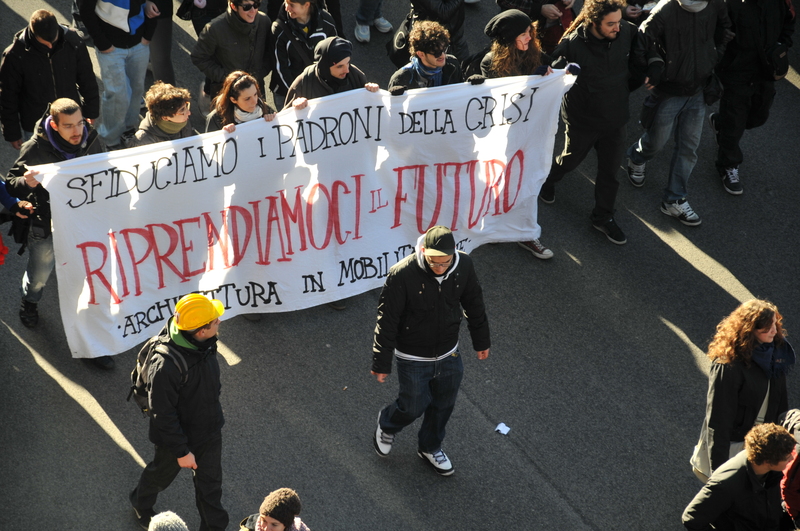 Many students were peacefully protesting for their future. And there were protesters who had nothing to do with the student crowd. Like the hundreds of men clad in black, coordinated in their actions. 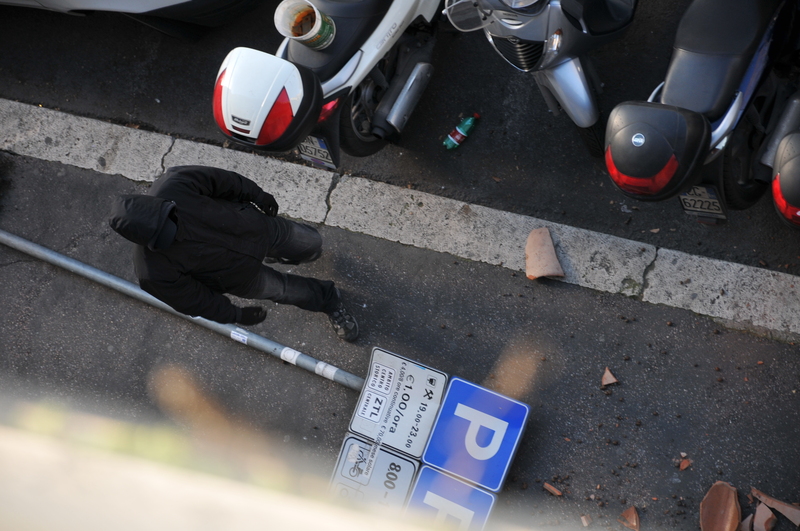 This guy here broke down a signalling post and used it like a leverage to open up the iron grate of the building. 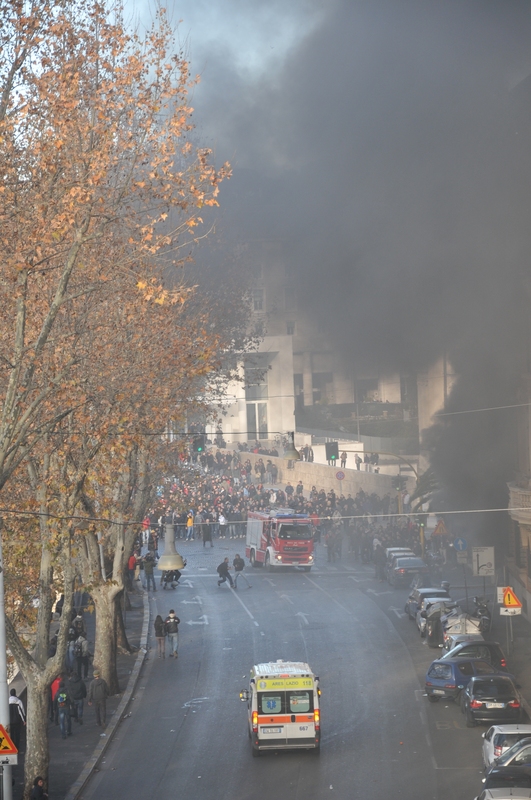 Tear gas, cars in flames, police vans exploding. A vista of Rome that you won’t find in tourist guides. The Grand Tour of agents provocateurs, with clear orders: discredit peaceful protests. To torch a police van you need skills and some practice, possibly every Sunday, during football matches. Ministers asked for “repression”. These are the same people who gave us Bolzaneto, G8 in Genoa. To tar everyone with the same brush: mission accomplished. You know how it ended, the government survived the no-confidence vote thanks to those MPs who got their mortgage estinguished or a brand new apartment, courtesy of the Prime Minister. As Der Spiegel writes tonight, it’s the triumph of operetta. Grotesque. Colin Crouch quotes Italy as being the forerunner of post-democracy. Maybe he’s wrong, after all. Here we’re talking about tribal pre-democracy. In the meanwhile the country crumbles down. GDP is in comatose state as tax receipts are, partly for lack of growth, partly for world-class free-riding. The government survived the no-confidence vote, Italy is in a deep self-confidence crisis: economic, social, moral. Its youth, its civil society, and even more its opposition are confused and stoned. This is Berlusconi’s nutrient broth.